AP Inter Exams 2019 Tim Table, AP Inter Public Exams 2019 Time Table, AP Inter First Year Exams March 2019 Time Table, AP Inter Second Year Exams March, 2019. Inter Exams Schedule, BIEAP - Intermediate Public Examinations March 2019 Time Table, BIEAP - Intermediate Public Examinations March 2019 Schedule, Intermediate First year theory examinations Time-Table-2019, Intermediate Second year theory examinations Time-Table-2019. The Board of Intermediate Education, Andhra Pradesh had released the time table for 1st and 2nd year Intermediate IPE March 2019 Examination which are scheduled to begin from February 27, 2019 for 1st year students and from February 28, 2019 for 2nd year students. 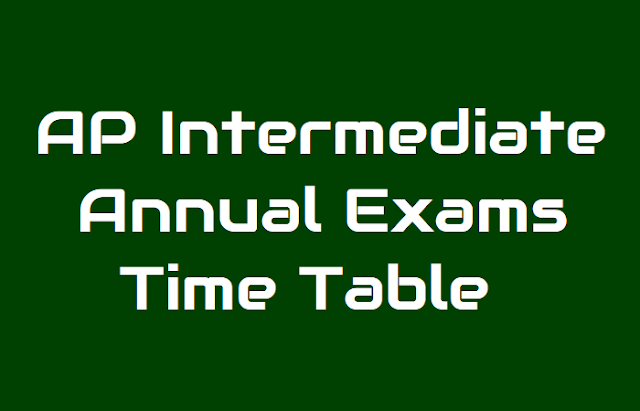 BIEAP - Intermediate Public Examinations March 2019 Time Table: The Board of Intermediate Education, Andhra Pradesh has announced the Intermediate examinations time table for the year 2019. The Board of Intermediate Examination has clearly indicated that the students of the entire state may have to follow the same methodology that has been enforced till now for the next year as well. The first year theory examinations will commence from February 27, 2019 and second year examinations commence from February 28, 2019 according to the Inter Board Officials. All examinations will be held from 9.00 A M to 12.00 Noon. The Practical examinations will be conducted in February, 2019. Secretary of the Board said that Public Examinations schedule is prepared keeping in view of the national level entrance examinations to be conducted in 2019". According to top source in Education ministry, there will not be much change in the formats for the next two years. a) Environmental Education Examination in January, 2019 from 10.00 A.M to 1.00 P.M (One day). b) Practical Examinations in February, 2019 . The below dates are applicable to Intermediate Vocational Course Examinations also. In continuation to the press release would be published in December, BIEAP inform you that the fresh Tentative Time Table for the conduct of Intermediate Public Examinations, March 2019 pertaining to General Courses has been released through the press. It is also available in the Board of Intermediate Education Website www.bieap.gov.in. A copy of the same is furnished overleaf. 1. Ethics and Human Values Exam: The Ethics and Human Values Examination will be conducted on 28-01-2019 from 10.00 AM to 1.00 PM. 2. Environmental Education Exam: The Environmental Education Examination will be conducted 30-01-2019 from 10.00 A.M to 1.00 P.M (one day). 3. Practical Exams: The Practical Examinations will be conducted from 01-02-2019 to 20-02-2019 in two sessions i.e. from 9.00 A.M to 12.00 Noon and 2.00 P.M to 5.00 P.M.
4. Theory Exams: Theory examinations will be held from 27-02-2019 to 18-03-2019 from 9.00 A.M to 12.00 Noon every day. Therefore, BIEAP request you to give wide publicity of the revised schedule among the teaching staff and students of your college regarding the dates, timings of the theory examinations and display a copy of the Time Table prominently on the Notice Board of your college without fail. Intermediate Exams time table 2019: The Board of Intermediate Education, Andhra Pradesh has released the tentative exam time table for first and second year intermediate IPE exam 2019. Students who will appear for the exam can check out the date sheet here. The exam for 1st year students is scheduled to begin from February 27 onwards and the exam for 2nd year intermediate students will start on February 28, 2019. ఇంటర్ పబ్లిక్ పరీక్షలు(ఐపీఈ)-2014 షెడ్యూల్‌లో మార్పులు చోటు చేసుకున్నాయని ఇంటర్ బోర్డు ప్రకటించింది. ఒకేషనల్ విద్యార్థులకు కూడా కొత్త షెడ్యూల్ వర్తిస్తుందని, అయితే ఎన్విరాన్‌మెంట్ ఎడ్యుకేషన్ పరీక్ష యథావిధిగా జనవరి 31న జరుగుతుందని తెలిపింది. ప్రయోగ పరీక్షలు ఫిబ్రవరి 12 నుంచి మార్చి 4 వరకు నిర్వహించనున్నట్టు బోర్డు పేర్కొంది.